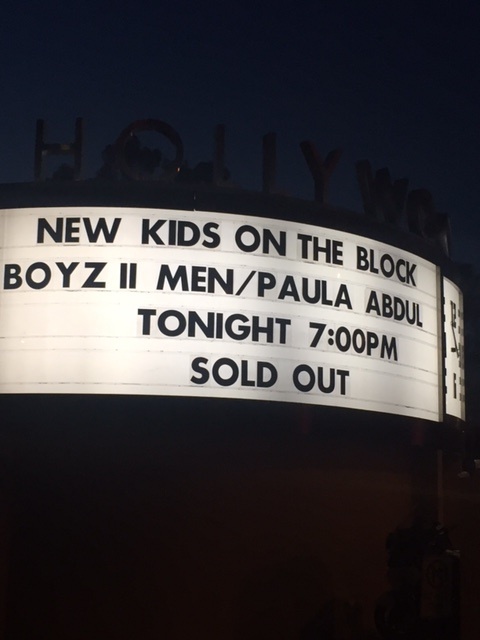 LA’s Hollywood Bowl Welcomes The Total Package Tour: Boyz II Men, Paula Abdul and New Kids On The Block! Last Friday night, (June 2) the Total Package Tour came to LA’s outdoor amphitheater, the Hollywood Bowl. 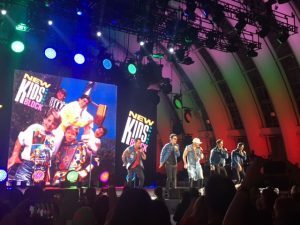 The show included performances by Boyz II Men, Paula Abdul and New Kids On The Block. This 44-city North American tour spans from May 12th to July 16th. It marks Abdul’s first tour in more than 20 years. #FlashbackFriday took on a whole new meaning as these three acts sang their biggest hits of their careers. Paula Abdul and New Kids On The Block reached the height of their success in the late 80’s to early 90’s. While Boyz II Men saw more fame in the early to mid 90’s. 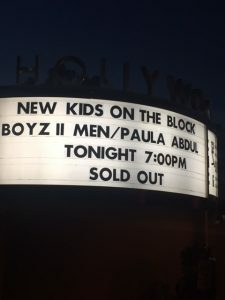 The sold out venue was filled with fun throwback 90’s attire and a mostly women audience ready to re-live their favorite musical moments from that era. Boyz II Men promptly got the night of nostalgia started with a jam-packed set at 7pm. The now trio is made up of baritone Nathan Morris and tenors Wanya Morris and Shawn Stockman. Together, they beautifully sang a handful of those emotional love ballads the audience fell in love with in the 90’s. Before performing “Opposites Attract,” the Gene Kelly intro to “Singin’ In The Rain” was played. An avid dancer, Abdul was inspired to be show business by Kelly in this classic film so it was fitting to heat that song played. Paula and her dancers were incredible and really got the party going on stage. As the headliner, NKOTB certainly delivered. With more than 80 million records worldwide sold under their belts, they came prepared to deliver. They danced, sang, rapped and flirted their way through the night. From the moment, Donnie, Danny, Jordan, Joey and Johnathan hit the stage, it was clear that the magic they all had back in their heyday was still very much there. For a boy band that enjoyed so much success over 25 years ago, it was amazing to see their music still resonate with this many people. The crowd was electric throughout the show and couldn’t be tamed. The guys were surely feeding off this incredible energy. They performed all the greatest hits. –“Stop It Girl”, “Popsicle” and “Be My Girl” from their self-titled 1986 album. 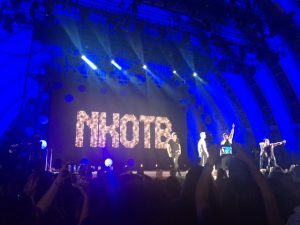 A big highlight of the show was during a fun mashup of “This Is How We Do IT”, “Games” and “California Love.” All of the members moved around the venue and found crowds to dance with. Joey found Full House’s Candace Cameron-Bure, Andrea Barber and Soni Nicole Bringas. 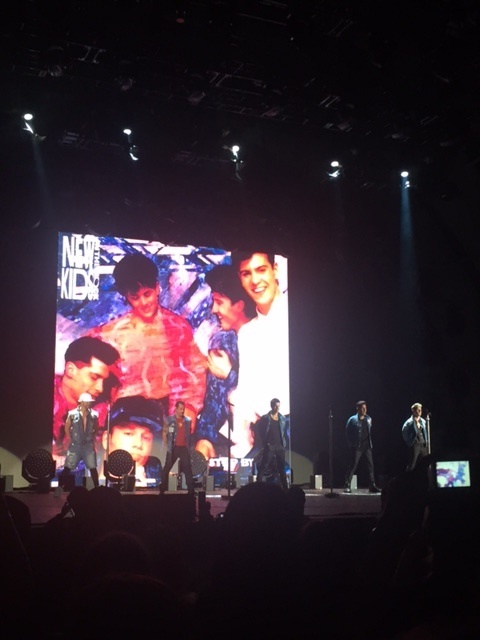 For the entire show, it was very obvious that NKOTB were ecstatic to be on stage singing again and eating up every bit of the applause. The night proved what seasoned performers all five of them are and how lasting their careers really are as well. An Interview With The Memphis-Based Indie Rock Group, CHINA GATE! An Interview With the NYC-Based Musician KRISTEEN YOUNG About Her Newest Music and More!